With 2018 drawing to a close, your pals at Bring Me the News are pausing to reflect on the year – its ups and downs, its trials and tribulations, its setbacks and triumphs, and, most importantly of all, the news stories that went viral. Here are some of the bigger ones that captured the attention of the entire internet – and our Minnesota readers – this year. A high school baseball player&apos;s act of grace at a big championship game tugged at the heartstrings of our readers – watch the video and you&apos;ll see why. It&apos;s a "geode rock cake," okay?! Well, the internet had different ideas – and it turned out to be a blessing in disguise for Nadia Cakes, a popular bakery in Maple Grove (as the headline suggests). Sometimes, you can&apos;t get a babysitter in time, or daycare is closed, and you just have to bring your kid to work. When this Eden Prairie meteorologist did just that – except it was to raise awareness of International Babywearing Week – the internet loved it. For Congressional candidates Dean Phillips (D) and Erik Paulsen (R), the 2018 campaign was very much one of attack ads, and boy, did it get ugly. But only one of those ads went viral – and it brought some much-needed humor to an otherwise bitter campaign season. We&apos;re not saying Dean Phillips won because of it, but this ad sure is hilarious. We all love to be reminded that the world of our forebears is not entirely gone. Even better is when you see that bygone world asserting itself in our modern one in some way, and proving itself still quite useful. Case in point, a pair of Belgian horses in southern Minnesota who managed to tow a stranded semi truck up a hill earlier this month. Horses 1, Internal Combustion 0. There were some serious moments, too, and this certainly was one of them. In this story, a mother&apos;s Facebook post brings some serious attention to Chaska Middle School East, where an investigation is now underway into the alleged bullying incident. As rocky as 2018 could be, there was also plenty to inspire us – like this soulful, heartfelt performance of John Lennon&apos;s "Imagine" by Adam Kornowksi, a fourth grader from Chisago City, Minnesota. A transgender teen identifying herself as Cece Doll, a student at Osseo Senior High School, reported that her privacy was invaded by school staff while she was using the girls&apos; bathroom – and she caught the entire thing on her camera phone. The resulting video not only went viral, but also became national news. Sometimes, you actually want the cops to interrupt your party. 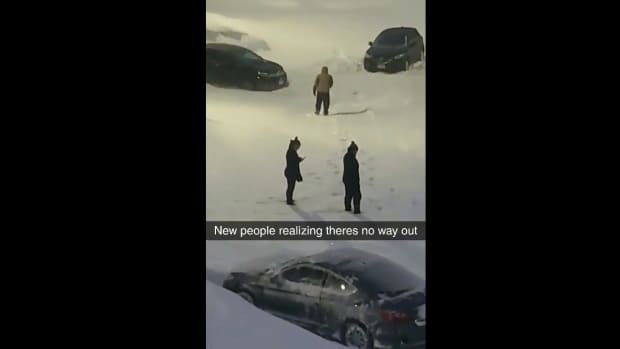 Because as this video shows, they might just want to join you for a round of Super Smash Bros.
What started as a noise complaint turned into this video featuring a pair of St. Paul cops, which proved to be an internet hit. Short and not so sweet, the obituary for Wabasso, Minnesota, native Kathleen Dehmlow became worldwide news for its eyebrow-raising candor. It&apos;s one of those situations where you&apos;re not sure whether you should laugh or shed a tear, but one thing is certain: Dehmlow&apos;s survivors will not miss her. Had your fill of year-end lists yet? Cool 'cos here's one of ours. The student was made to leave a bathroom at Osseo Senior High. The captions and music inserts make this video extra entertaining. Nobody caught on during her three-plus months secretly writing the lyrics.